You may be looking for the castle. "Possesses colossal power, but reduces max MP by 1." Chest in the Grand Hall. "A special attack card that can break through physical defenses. First-class strength." Speak with Naminé after defeating Larxene. "Has great strength, and allows the Drive Gauge to restore quickly during MP Charge." Reunite with Riku in The World That Never Was. "A Keyblade black as darkness. Boasts superior Strength and Magic." "A Keyblade that rewards wielders who share its hurt. Its powers will draw out your full potential." Defeat Data-Riku at Hollow Bastion I.
Slay 60 enemies with the Oblivion. Slay 120 enemies with the Oblivion. Slay 180 enemies with the Oblivion. Slay 240 enemies with the Oblivion. 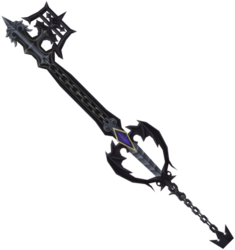 The Oblivion is a Keychain for Sora's Keyblade which appears in Kingdom Hearts, Kingdom Hearts Chain of Memories, Kingdom Hearts II, Kingdom Hearts 358/2 Days, and Kingdom Hearts Re:coded. In Kingdom Hearts 358/2 Days, it can be upgraded to the Oblivion+. It also appears as half of Roxas's dual set of Keyblades alongside the Oathkeeper, and was transformed from the second Kingdom Key Roxas obtained after absorbing Xion. Fundamentally, the Oblivion is symbolic of Sora's memories of Riku. [please confirm] In Kingdom Hearts, the Oblivion is found in a chest in the Grand Hall, across from where Sora defeated Riku, in Kingdom Hearts II, Sora receives the Oblivion after he reunites with Riku and Kairi in The World That Never Was, and in Kingdom Hearts Re:coded, Data-Sora receives the Oblivion after defeating the possessed Data-Riku in Hollow Bastion. In Kingdom Hearts 358/2 Days, Riku himself can wield the Oblivion. Oblivion is similar in shape to the Kingdom Key, though is black and has a longer reach. The hilt guard is comprised of two bat-like wings extending downward. The teeth are in the shape of the Kanji for "darkness" (闇). The Keychain's token is a black version of Sora's crown necklace. A chain-like design runs up the length of the blade. The diamond in its hilt also resembles the diamond in the original logo of Hollow Bastion. When the Oblivion is summoned in Kingdom Hearts II, black smoke and violet sparks surround it. The Keyblade's name means a "state of forgetting or having forgotten", and its Japanese name has the same basic meaning. The Oblivion is often associated with the memories that are passing away, such as when Sora reaches the last floors of Castle Oblivion, or when Roxas begins forgetting Xion following her destruction. In Kingdom Hearts Re:coded, the names of the Oblivion's upgrades allude to the protagonists of the series. "Wind" is associated with Ventus, "Earth" matches up with Riku and Terra, "Sea" corresponds with Aqua and Kairi, and "Sky" references Sora. Riku is the only one able to wield the Oblivion Keyblade on its own in Kingdom Hearts 358/2 Days, though Roxas can wield it in conjunction with Oathkeeper. Riku can equip the Oblivion by equipping the Pandora's Gear or the Pandora's Gear+. The ground combo consists of a lone rush forward, then if you press then he will do an uppercut into the air and jump slightly. If you press again, then he will do a violent downward thrust. If you press instead, he will do a 360° spinning slash on the left side, and ends with an upward slash with a slight jump. The aerial combo consists of a diagonal upward slash from the right leg, the same slash from the left leg, another slash from the right leg, a smack with the teeth area, and a violent downward thrust with the top of the Keyblade. A limited edition Oblivion was released with four other Keyblades in a special Play Arts Figures accessory set, Play Arts Arms. In the intro of Kingdom Hearts 3D: Dream Drop Distance, Roxas is shown dual wielding the Oathkeeper and Oblivion against Axel; Riku also wields the Oblivion against Xemnas, while Sora uses the Oathkeeper. Later, when Mickey summons Ventus, Aqua, Terra, and Roxas to aid him, Sora, and Riku in a battle against Xehanort, Roxas can be seen summoning the Kingdom Key before it quickly transforms into the Oblivion. The Oblivion appears as a 6★ Keyblade. It can be acquired from the Relic Draw during the Kingdom Hearts collaboration event. The Oblivion bestows the Arcane Overstrike Soul Break Aura of Darkness when equipped to Riku. This page was last edited on 19 April 2019, at 12:36.